Built To Last. Built For Safety. Built For Simplicity. 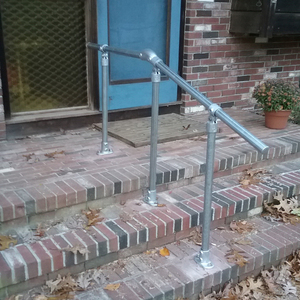 Stair railing kits that use a modular pipefitting flange to mount the upright to the surface of the stairs. 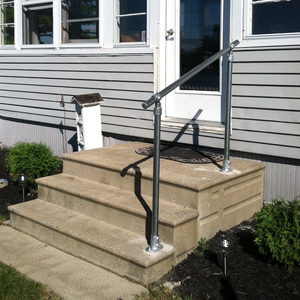 Outdoor stair railing kits that mount to existing walls or posts. 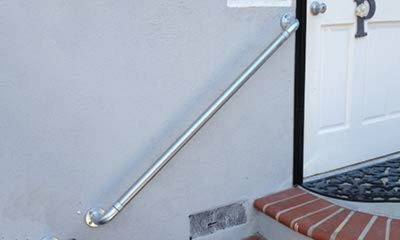 Stair railing kits that mount to an existing wall or post at one end and a surface mounted upright on the other end. 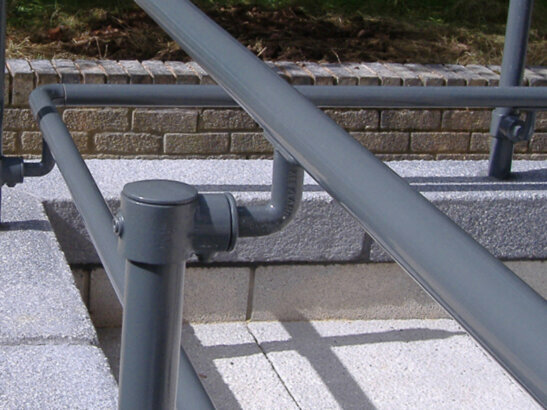 Our railings use weather-resistant fittings and pipe that are designed to last decades in any outdoor environment. Great for retrofitting existing buildings for insurance and accessibility compliance. 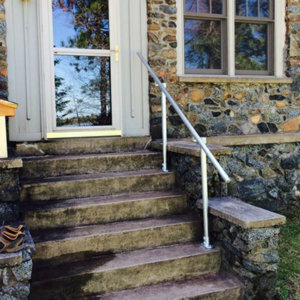 Our stair handrail kits contain all the parts you need to complete your project. Talk to a human and get the knowledge you need. Our team is here to help you! 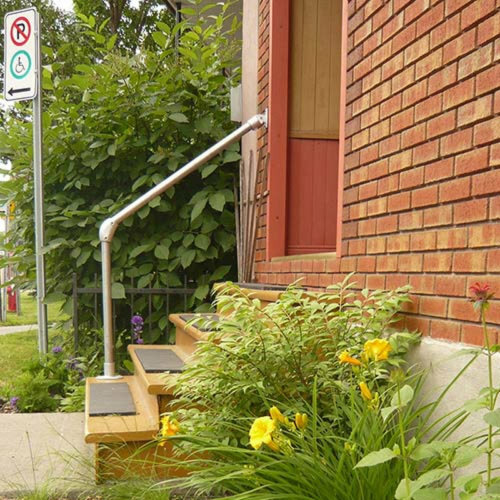 How Simple Are Simplified Outdoor Stair Railing Kits? 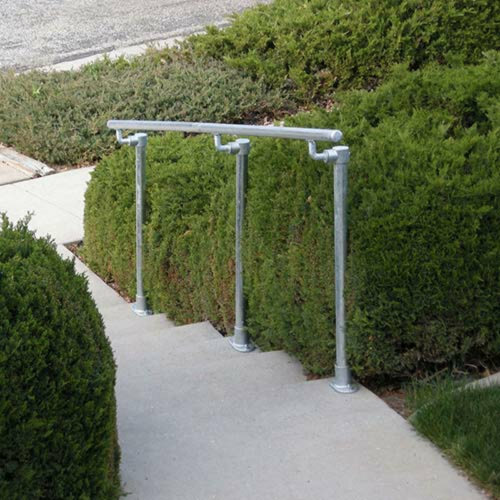 Assembling your outdoor stair railing kits is fast and easy. 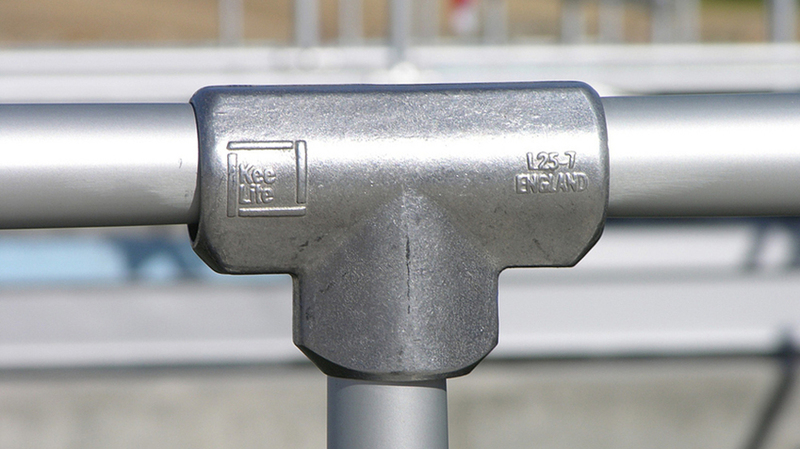 This video will give you a good idea of what is involved in building a Simple Rail handrail. 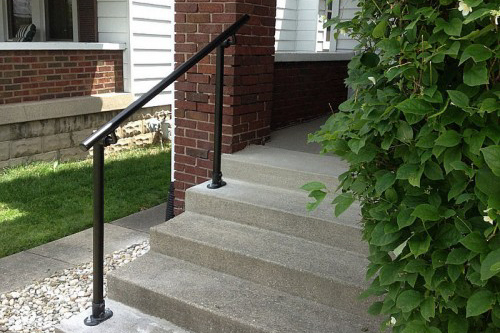 To learn how easy it is to install our other stair railing kits, click here. It was getting more and more difficult for my Mom to go from her family room to her patio where she loves to sit and drink her coffee every morning. 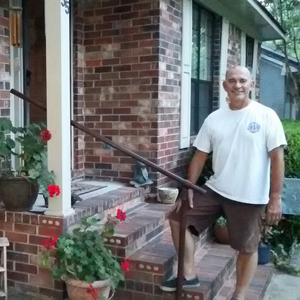 We put in one of your simple railing kits and now she can manage the steps with confidence. She is thrilled to have the railing in place and it feels very secure to her. Everything worked well during the installation. I'm very satisfied with this solution to our problem. After my father died a little over a year ago, my mother was adamant in her desire to continue living alone on their 80-acre farm. Since then, my brothers and I have been working on projects around the house that will help her keep her independence, but live safely at the same time. 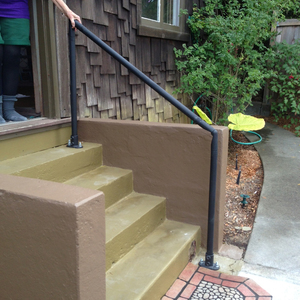 We installed handrails out her back door, which had not been present before the task was undertaken. The job was a snap, and the Kee Klamp and Kee Lite fittings were the perfect fit for this job. 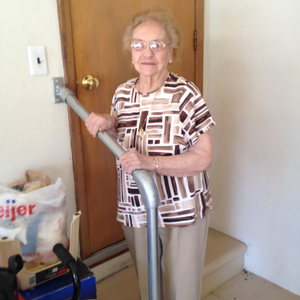 The pictures show the completed job and our happy 86 year-old mother. The rail was for my mother who has difficulty navigating steps. 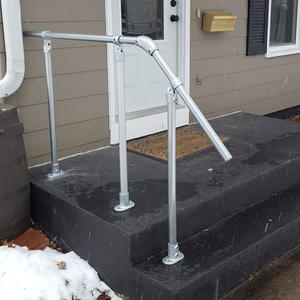 I installed the rail in the center of the steps. That way she can use the hand of her choice. I painted the rail with a black hammer finish. It looks great and is super strong. Thank you for a great product! My elderly father was visiting and fell as he tried to go outside to our backyard. We clearly needed a sturdy handrail. This was the best solution ever. It shipped fast, was very reasonably priced and the quality exceeded our expectation. Very strong and sturdy. Thank you for making such a quality product. 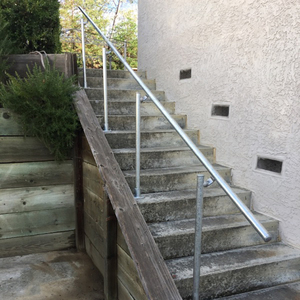 This was a simple railing project up some stairs. 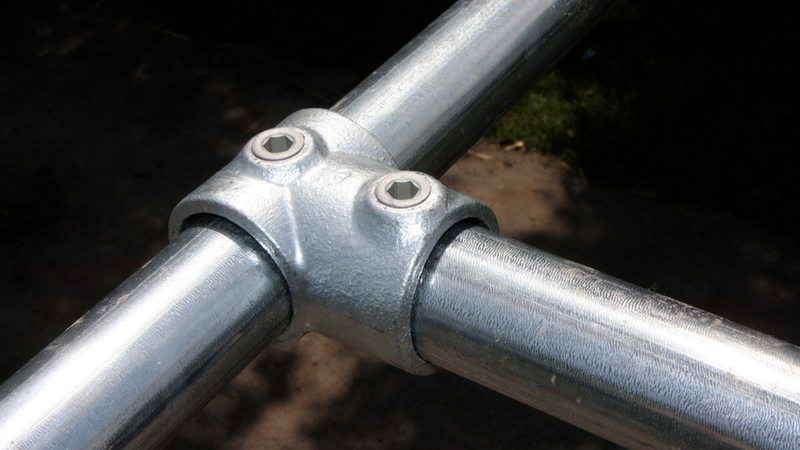 This product made it easy to meet local building codes and maintain durability.